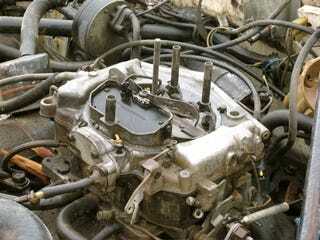 The Carter ThermoQuad originally came bolted to Mopar V-8 mills as a the hot factory setup. The theory was simple. At light throttle the ThermoQuad huffed air through a relatively small set of primary bores. Application of lead foot prompted the much larger secondary bores to open, giving the ThermoQuad its unique sound at wide open throttle, and supplying the engine with plenty of air and fuel. Problems arose when the mostly-the-same ThermoQuad was pressed into the '70s and onto emissions engine service. Featuring a center section made of space age polymers prone to warping phenolic resins, the Thermoquad had issues with the underhood heat from the scads of smog prevention equipment bolted to the engine. The last of the Thermoquads was an aftermarket affair known as the SuperQuad! Some swear by the carburetor as an unsung performer. Others just swear at the carburetor.